Of course, there aren’t “negative calorie” foods per se; all foods have calories. But once ingested, these specific foods have a negative caloric effect in your body, hence the name of “negative calories”. Along with many health benefits of negative calories, here you’ll find the list of negative calorie food featured in the much-talked about Negative Calorie Diet Plan. Read on for the whole scoop on the so-called negative calorie foods and taking advantage of the “negative caloric effect” for weight loss. What is a “negative caloric effect”, exactly? 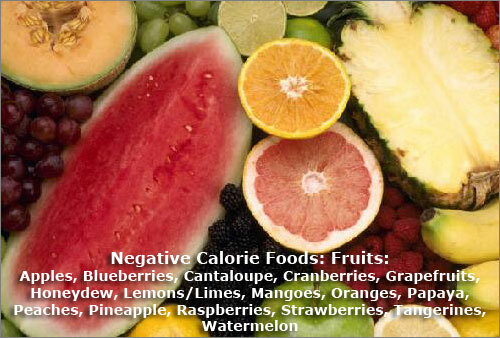 Well, it refers to specific veggies, fruits and spices you’ll find on the list of negative calorie food below. These are mostly low GI (low glycemic index) foods, which require your body to burn more calories for digesting them than their actual calorie content. To make up for this calorie deficit, your body burns stored fat as the source of energy. Because of their high fiber content, you feel satiated longer than with other foods. Your hunger pangs and food cravings are greatly reduced. As a result, you eat less but healthier and end up losing weight. 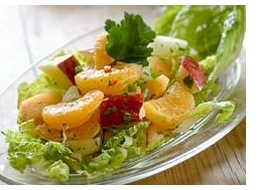 The vegetables, fruits and spices on this negative calorie food list are loaded with vitamins and minerals. These are foods that boost metabolism and enzyme production, triggering your body’s fat-burning physiology. As you can see, the benefits list of negative calorie foods could go on and on, no wonder why all the buzz about the Negative Calorie Diet Plan. All right. Let’s take a look now at the most popular negative calorie foods. All of them have not only health benefits, but also important weight loss benefits. 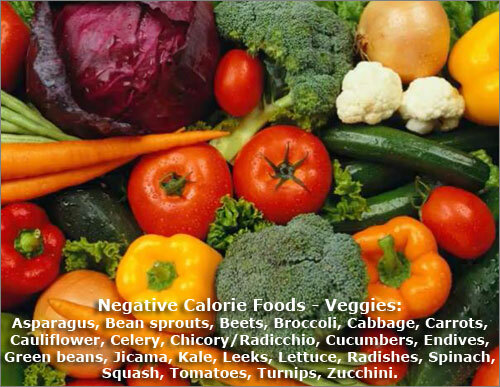 Vegetables on the negative calorie food list are: Asparagus, Bean sprouts, Beets, Broccoli, Cabbage, Carrots, Cauliflower, Celery, Chicory/Radicchio, Cucumbers, Endives, Green beans, Jicama, Kale, Leeks, Lettuce, Radishes, Spinach, Squash, Tomatoes, Turnips, Zucchini. Fruits on the negative calorie food list are: Apples, Blueberries, Cantaloupe, Cranberries, Grapefruits, Honeydew, Lemons/Limes, Mangoes, Oranges, Papaya, Peaches, Pineapple, Raspberries, Strawberries, Tangerines, Watermelon. 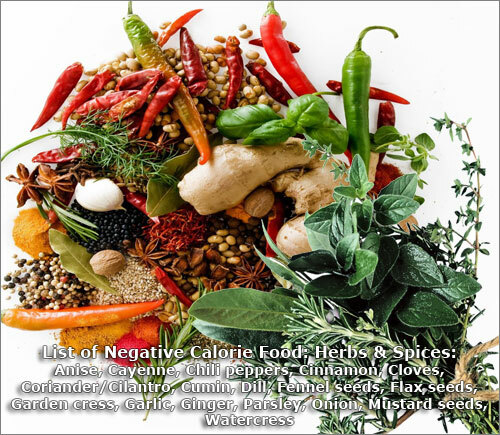 The spices and fresh or dried herbs on the negative calorie food list are: Anise, Cayenne, Chili peppers, Cinnamon, Cloves, Coriander/Cilantro, Cumin, Dill, Fennel seeds, Flax seeds, Garden cress, Garlic, Ginger, Parsley, Onion, Mustard seeds, Watercress. Now, there’s something very important you must understand. To lose a significant amount of weight you must eat at least 2-3 pounds of a mix of these foods daily. The whole foods, not the juice; blending them is okay, as long as you consume them immediately. Of course, it’s best if you can get them organic because they’re pesticide-free. Eat them either raw (best option) or slightly steamed. Also, you won’t want to mix them with any empty calories (i.e. junk foods), or the negative caloric effect is lost, as shown on the list of free Negative Calorie Diet Tips. You know how almost everyone has been programmed to believe that if it’s healthy – it must be tasteless, right? Well, ignore this. You’ll be surprised to find that you can use these negative calorie foods to prepare delicious recipes in a snap – you’ll enjoy eating healthy again! …so that the sweet crispiness of a yummy Red Delicious apple is enhanced by the tangy succulence of an orange. Want more negative calorie food recipes, including tasty recipes for the famous negative calorie diet soup? Take a look at the Negative Calorie Diet Plan.